One downside is that people might feel discouraged that they can't do that movement (OHS or CTB pullups) - they shouldn't feel that way - you can still do the workout and scale it...take each Open WOD as a challenge to get better. Each of the past 2 Opens saw me achieve a new PB at something...have a go! This year also has the Scaled option for those that can't do CTB pullups...but if you did the workout last year, consider doing it again the same way so you can compare. This blog will be broken into advice for those close to CTB pullups and for those who have CTB. If you are not even close to CTB pullups, that's ok - get your 10 OHS and then scale and work on your pullups. Hand care people (Thanks JH for the reminder!). Need to start shaving those callouses. If you tear, it may affect your ability to repeat or even perform well in the following weeks. Don't over chalk - sweat plus excess chalk = slippery goop!! 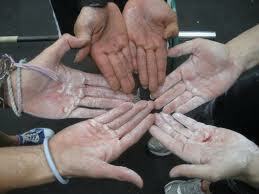 Also, too much traction can cause tearing...in the future, work on your grip strength to hang onto the bar for longer! I found that keeping tension in my shoulders helps...I got tight by do some presses with the bar between CTB pullups to keep them tight. It helped. Consider using a chin-up grip - palms facing you - this can help getting your chest to the bar. in fact, try different grips and see which works best with your kip. The OHS is really just the movement that takes up time...this all boils down to CTB pullups...so break it up into 5 and 5 if you want to preserve your shoulders but seeing as though you don't really have CTB, just get them done as you will probably only be doing one round of OHS anyway so get as much time on those CTB attempts! If OHS really IS a problem for you, DO NOT lock your shoulders at the top but only do what you need to be stable. Your shoulders should lock at the BOTTOM of the squat. This is because most people incline their torso forwards to get to depth and so their shoulders need to extend (technically it is flexion!) further behind them. If your shoulders are locked already before you incline forwards, you have nowhere else to go so the bar will go forwards! You should be able to make it through to 12/12 and 16/16 even - just stay calm and chip away at the reps. I really think the key is not to burn out early...work out what the pacing should be and try to stick to it. The CTB Pullups will be where it counts...the first 2 rounds will be easy enough for you I think. Then it will start to hurt. Because of that and the fact that you can finish these 2 rounds relatively quickly, consider INTENTIONALLY breaking up your CTB PUs early on. Tempo is key! You don't want to end up failing in reps because it will take too long for the energy systems to recover - drop off the bar earlier rather than holding on to squeeze out another rep or two. 18/18/18/18 is 72 reps in 180secs - that is not a lot of time to move from the bar to the rig. 20/20/20/20 is 80reps in 180secs - not many people will get to or past this level. Warm up will be crucial. You definitely want to be ready to access the energy stores you have. Ensure that the movements of OHS and CTB pullups (progressing up to the Rx'd weight) are grooved in and you know where you are at. I would recommend at least 12-15mins of warming up with light areobic exercise including the WOD movements to get things online right. Rest at least 3-5mins before the workout...maybe longer. Chalk - don't overdo it! Inchworms 5-10 good, loong, slow ones - feel your body extending out into the range that you need for full-on beast-mode! OHS with the bar (20kg), 30kg, 45kg - maybe 10-15reps at each weight level - consider using a 15kg bar with 2x15kg plates - this will help preserve the thin 10kg plates! Any suggestions you have are welcomed in the comments below! Subscribe by email in the box at the top right of this blog - thanks!